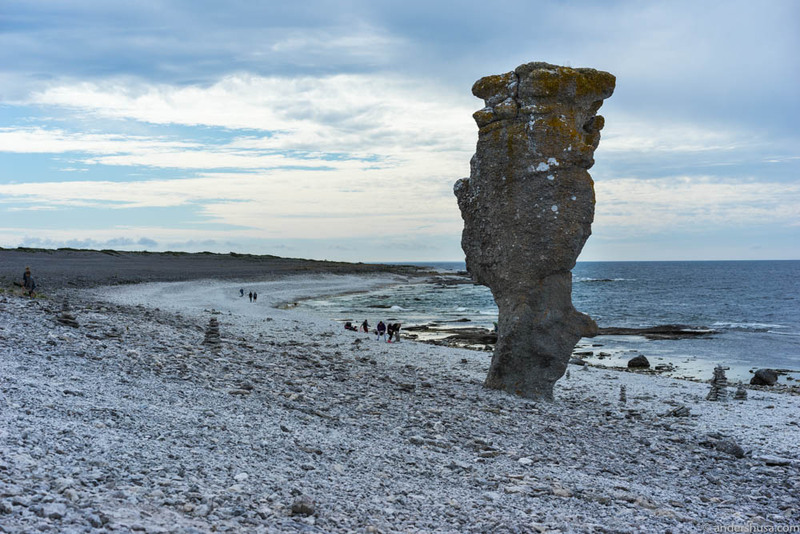 Gotland is Sweden’s largest island and sometimes referred to as the limestone Hawaii due to being mainly made up of sedimentary rocks. 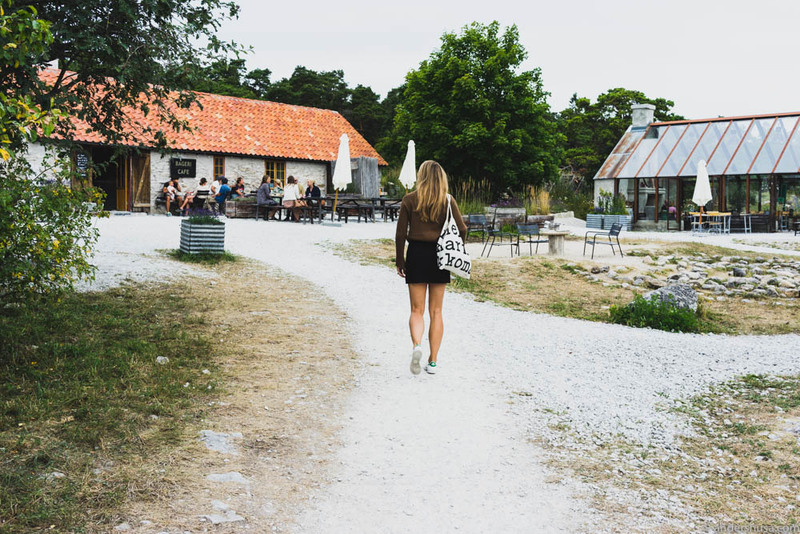 I went to Gotland together with Visit Sweden and fellow bloggers HellesKitchen, Urbania Magasin, Hedda Over Heels & Sekk og Sandaler. 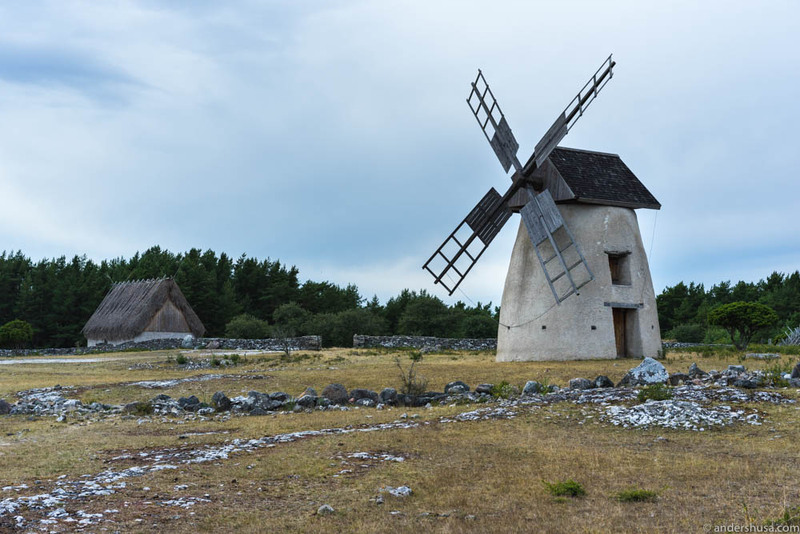 Although, the main goal on my part was to explore the island’s food scene, I was also impressed by Gotland’s truly unique landscape and scenic scenery. I discovered that most attractions and food destinations are in the countryside and outside the cities. 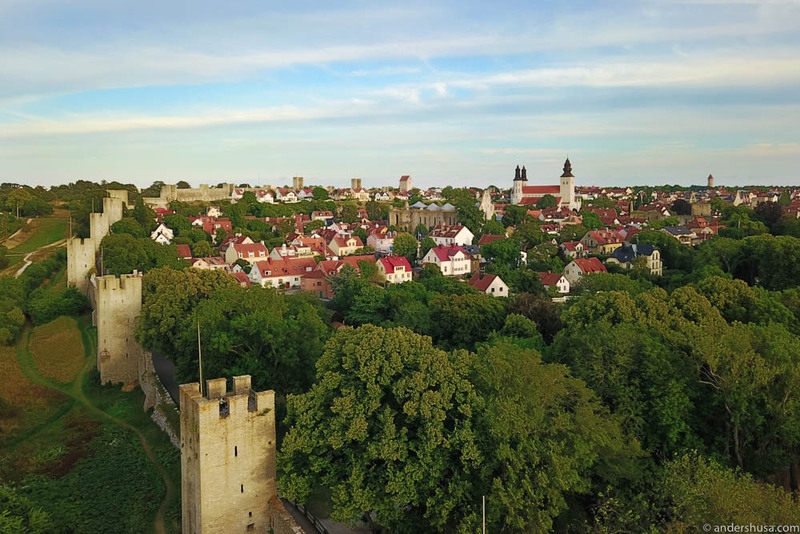 I’ve divided my guide into three areas of Gotland: Visby and its surroundings, the south of Gotland, and the north of Gotland including Fårö and Bungenäs. That’s about as much as you’ll be able to cover in three to four days. SAS has direct flights (45 minutes) from Oslo to Visby and back every Wednesday and Saturday in the time period of June 24th till August 12th. The rest of the year, you probably have to transfer through Stockholm, from which you could also take a 3-hours ferry ride to Gotland, by the way. With only three to four days to spend here like us, you’re gonna need a car. It would take you a full day to cycle from one end of the island to the other, but if you’re up for that challenge – go ahead! 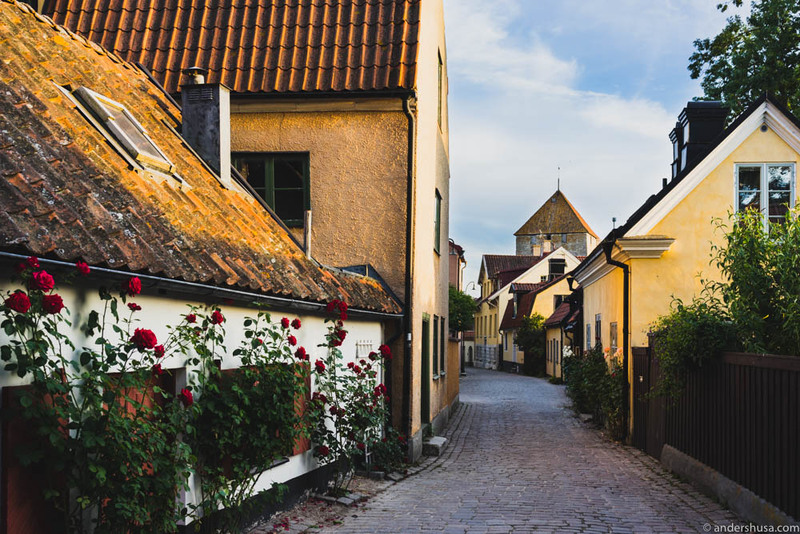 Visby is the best-preserved medieval city in Scandinavia and on the list of the UNESCO World Heritage Site. The beautiful old capital has a long town wall that encircles the town center with 27 of the original 29 towers still standing. If you wanna go for a run in the morning, I can highly recommend the route around the city walls which takes about 20 minutes (roughly 4 km). Head 20 minutes north of Visby town to have breakfast or fika at Själsö Bageri. 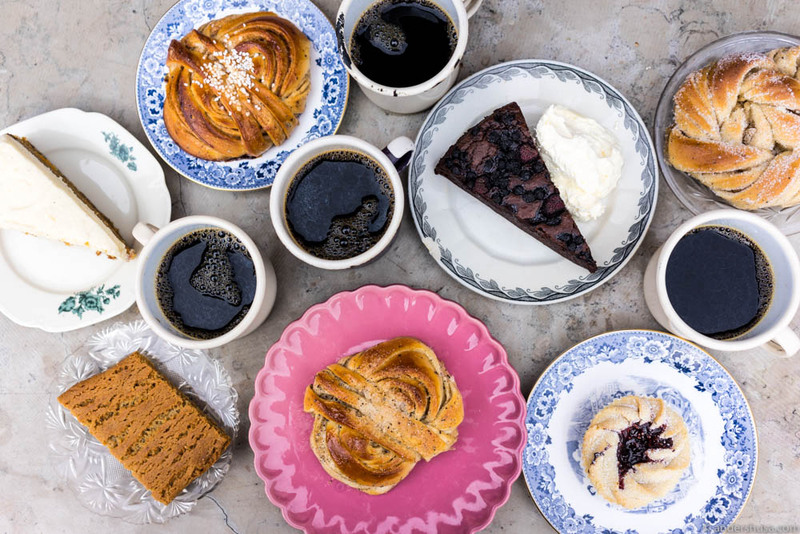 In case you don’t know, fika is a concept in the Swedish culture that means to have coffee and something small to eat. Located in an old sailor’s hut and run by two Stockholm expats, Fredrik Ekman and Claes Johansson, the stone-oven bakery produces excellent sourdough bread (bröd), bread rolls (frallor), sandwiches (mackor), and cinnamon and cardamom buns (bullor). The latter is their best-seller. 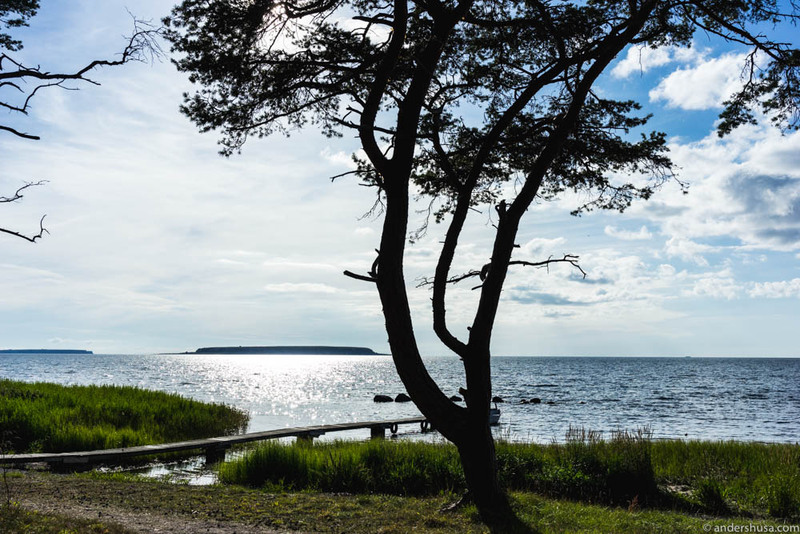 The mild maritime climate of the island, combined with a limestone-rich soil, results in a lush vegetation and warmer weather – usually reserved for more southern latitudes than Gotland. 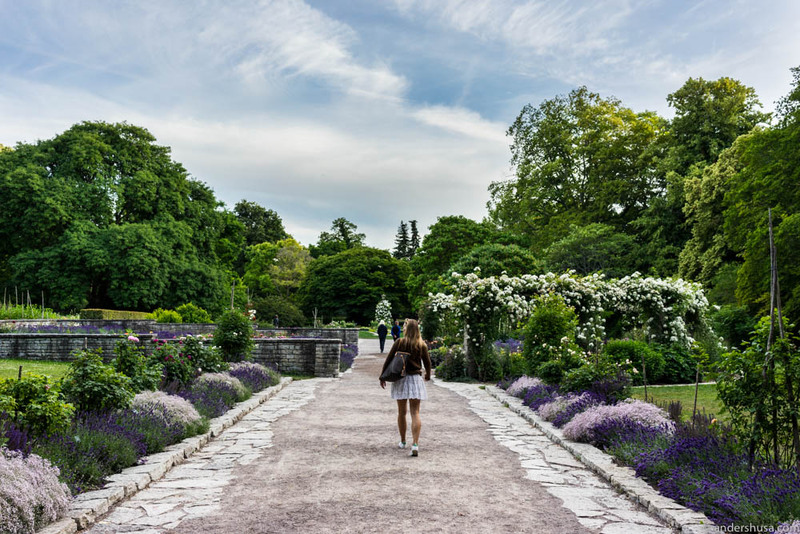 Thus, in the Botanical Garden of Visby, you’ll find more exotic plants than normally in Scandinavia. Just outside the city walls of Visby, barely 1o minutes south by car, you find another stone-oven bakery with a big al fresco garden. Leva Kungslador serves a daily organic brunch, where you can taste their magnificent bread, but why not just get a Croque Monsieur in stead? 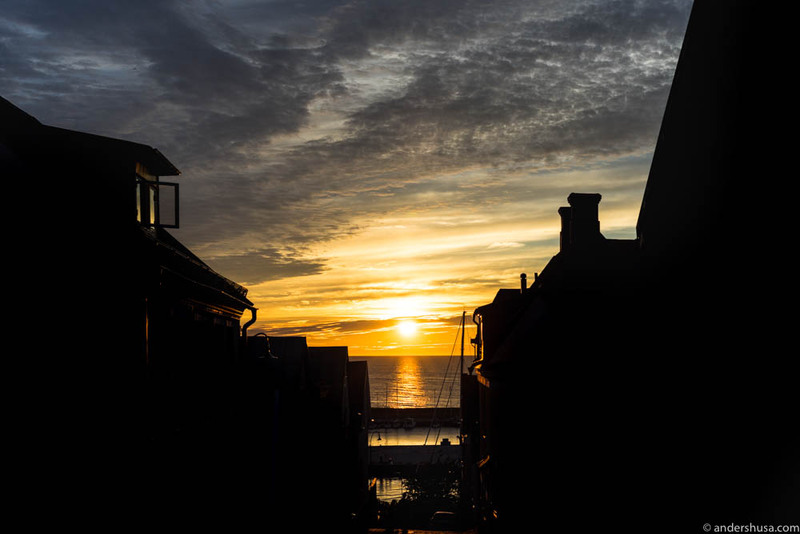 Take an evening stroll along the beach promenade for a breathtaking view of the spectacular sunset over Visby. The first night, the sky was lit up in colors of red and orange, and another evening it was blue and yellow. 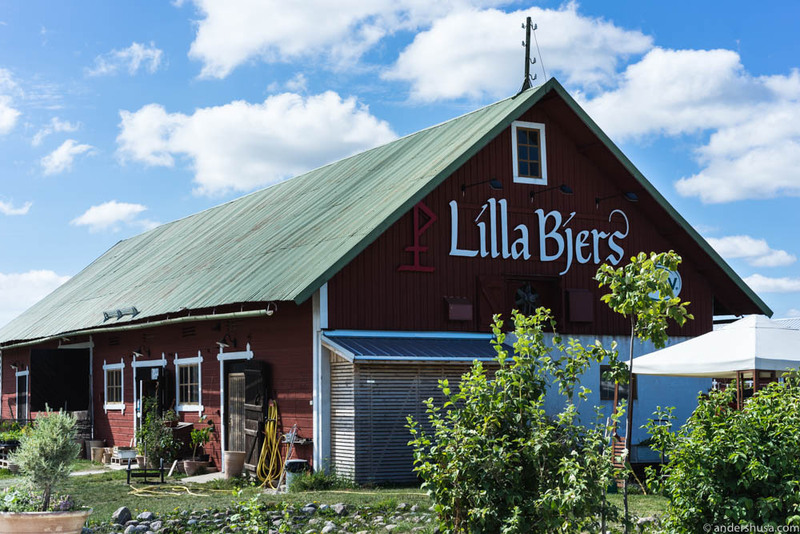 Lilla Bjers is a farm shop and greenhouse restaurant situated 20 minutes south of Visby. The eatery limits their menu to the organically grown vegetables and fruits from their own farm. Head chef Jonathan Kasche sources the remaining ingredients, like meat and dairy, from nearby organic farms on Gotland. It doesn’t get more farm-to-table or sustainable than that. My favorite dish was lamb with variations of carrot (baked, pureed, and pickled), but, unfortunately, that didn’t translate too well through the camera lens. The homemade juice pairings were even better than the wines. 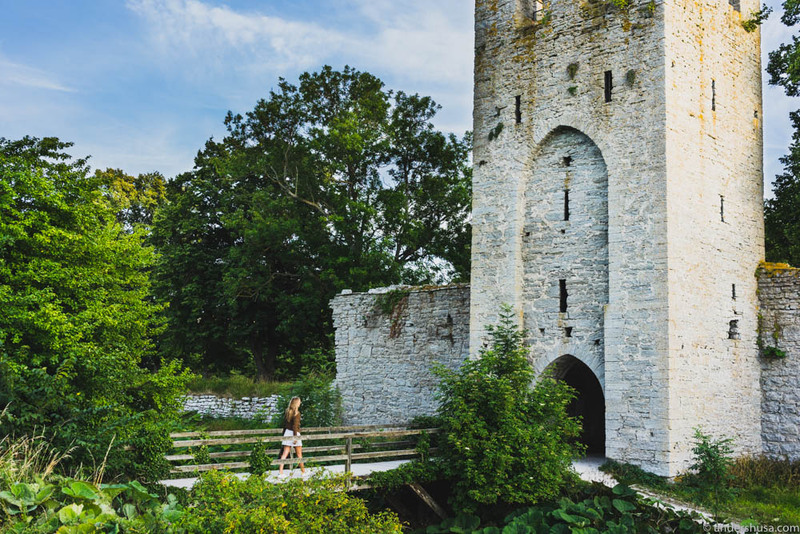 To get the proper feeling of a Mediterranean holiday paradise, you need to travel further south on Gotland. Watch as the landscape changes, the temperature rises slightly, and even the food becomes better. 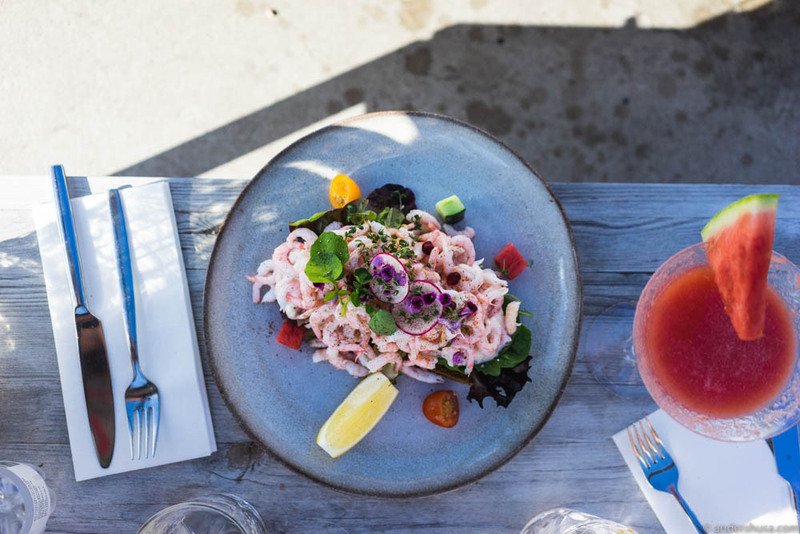 The district of Rone is home to the island’s very best restaurant – the Yellow Hen. 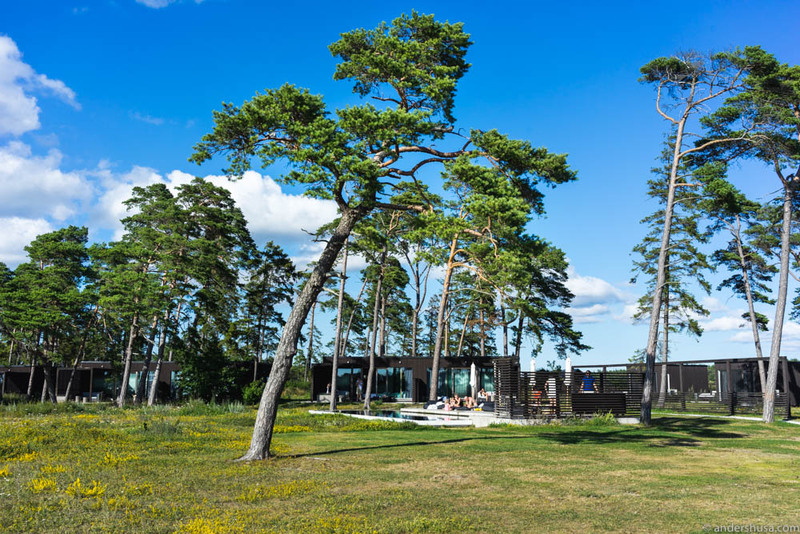 Among tall trees on a lush, green field with a view towards the ocean, you find Djupvik Resort. A true gem of a hotel. We didn’t stay here, but I wish we had. However, we did get a taste of their famous shrimp sandwich (räkmacka). Soft, somewhat sweet, rye bread topped with a mountain of freshly caught, hand-peeled shrimps. Can you imagine staying a few nights here at Djupvik Resort? In the small town of Ljugarn on the East Coast, you shouldn’t miss a lunch at restaurant Smakrike. They even double as a hotel, with six exclusive rooms (ad: affiliate link). We ate the simpler and more rustic, bistro-style lunch, but head chef Rickard Hasselblad assured us that he takes it up a notch for his evening tasting menu. Most of the produce is from Gotland, but Hasselblad isn’t afraid to mix in some foreign spices and techniques from his many inspirational trips abroad. 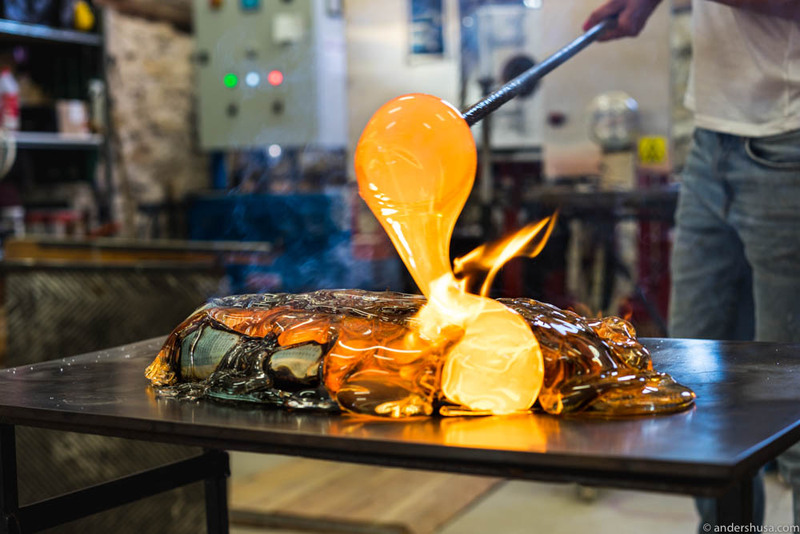 Eat Food Cooked with Molten Glass! 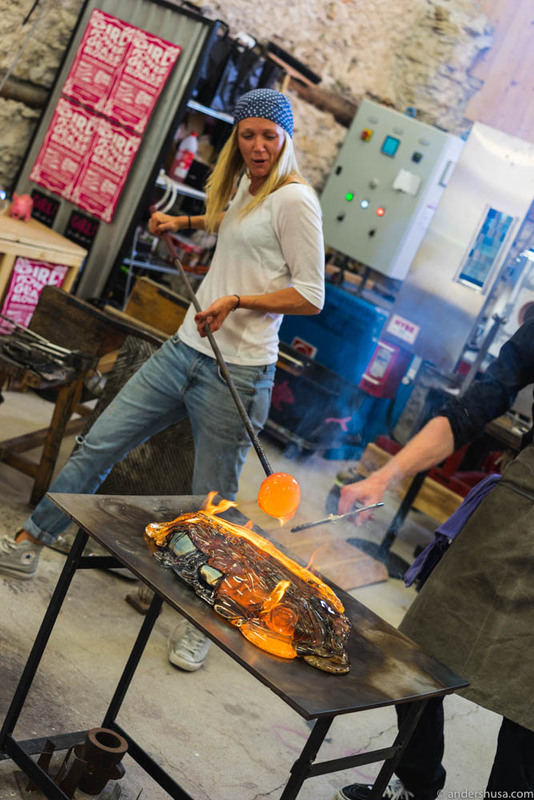 Together with glassblower Jennie Olofsson of Glasstudion Big Pink, chef Luqaz Ottosson runs Restaurant Rot. A tasting menu in a social dining setting, where they cook with molten glass! I have dedicated a separate story to this place. 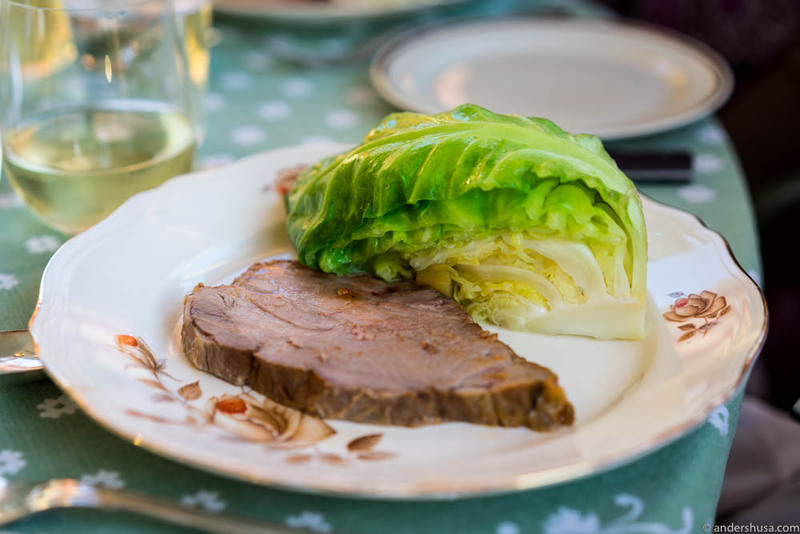 The best restaurant on Gotland is Gula Hönan – also known as the Yellow Hen. 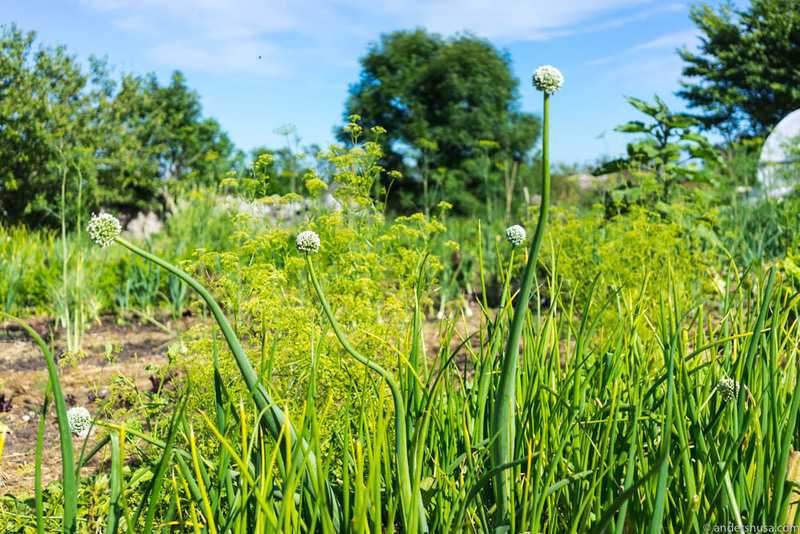 A bright yellow guest house with a beautiful wild garden, where every green ingredient cooked is homegrown. There’s also a more casual and spice-driven outdoor restaurant called Hönans Picanteria & Grill. The Yellow Hen is at another level food-wise, compared to the rest of Gotland, and you can read the full story here. Carrots & chicken broth. Amazing dish! Bungenäs is one of the strangest areas I’ve ever set foot in. On a remote peninsula, with barren strips of land, you find a defunct limestone quarry, and a former military training ground peppered with old bunkers. I totally loved it! 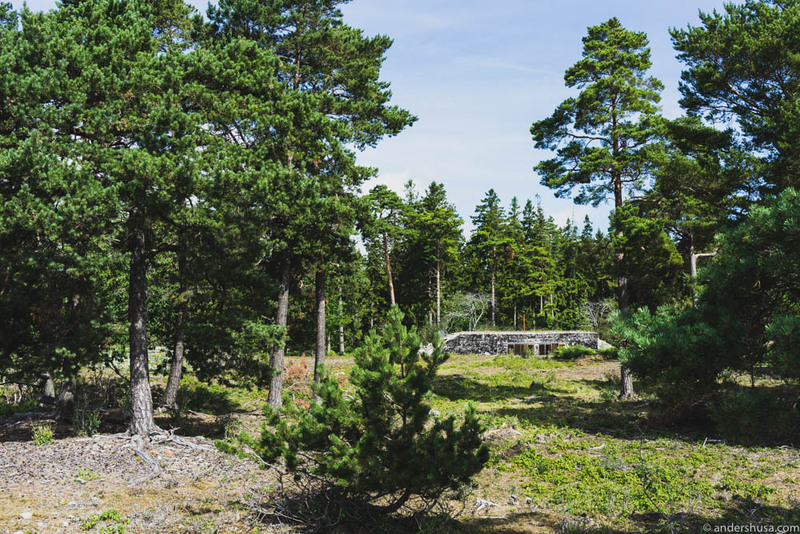 The territory was reopened to the general public in 2007 when entrepreneur Joachim Kuylenstierna bought the land from the army and hired Gotland-based architect firm Skälsö Arkitekter to restore the old bunkers into contemporary pieces of architecture where people could live and work. Fårösund Fortress at Bungenäs is a former stronghold from the mid 19th Century, now turned into a boutique hotel. Do like us, and check in to one of the vaulted rooms in battery no. 1 (ad: affiliate link). There are no windows, but it’s very cozy (once you get past the iron fence and the skulls). Beware, as your car will get covered in white dust from driving on the limestone roads leading up to the fortress. Thank you, don’t come again? Cars are banned inside the former military area, so we had to park ours at the parking lot outside and walk from there. However, there are also old bikes that the military used, which are now free to use. Calle Fegth is a Norwegian wine designer, and one of the co-founders and previous owner of well-known Norwegian restaurant Credo in Trondheim. Together with his wife, Anna Matton, he runs a café created within a former self-service store called Nyströms. Here, situated at the waterfront, we ate the most splendid breakfast of the entire trip. More information to come in my full story on Calle Fegth, his café, and his wine bar. 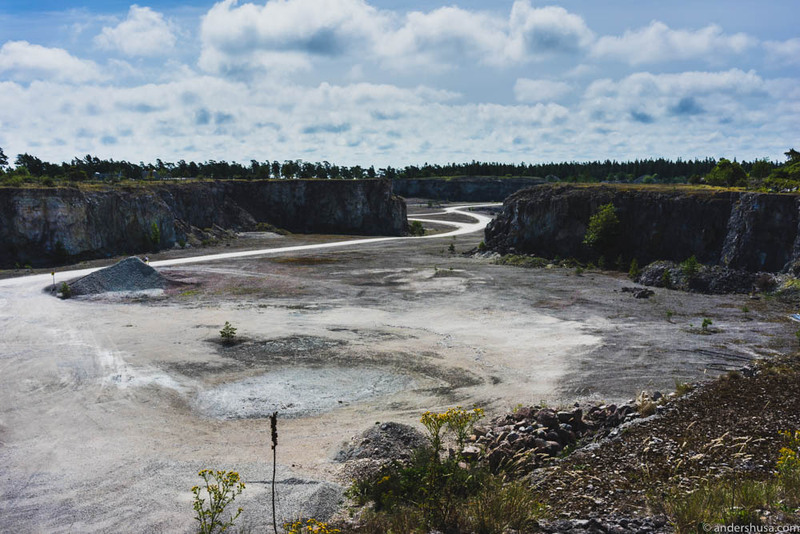 There’s so much to see in the old limestone quarry of Bungenäs. Kalkladan is an art gallery, concert venue and cinema, bar and restaurant, while Bungenäs Matsal is a more fine dining venue (although in a casually Nordic style). I didn’t try any of these, so I can only say that they look awesome, and I would love to go back one day. If you walk through the area you will also be able to admire some of the bunkers that have been reused as houses. Although, they can be difficult to spot since they are completely adapted to the surrounding nature. The Fårö island is separated from Gotland by the narrow Fårö strait, and connected by two car ferries, that travel back and forth to Fårösund every 10 minutes. It’s well worth a trip to this island – if only to see the oddly shaped rock formations called rauks. Stop by the austere and deserted landscape of Langhammar, where the spectacular sea stacks, known as rauks, tower majestically on the rocky beaches. 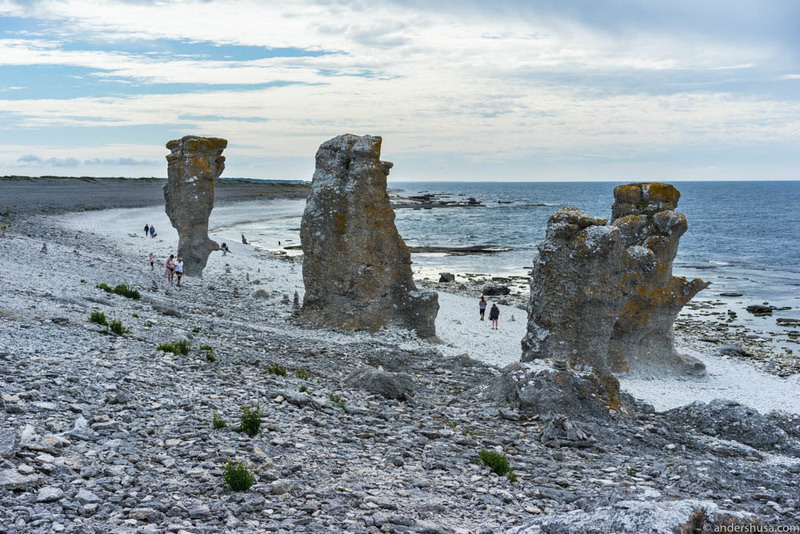 These Ice age stone monoliths are a result of erosion, and totally unique to Fårö. Time for more fika! Rute Steungnsbageri is, as the name suggests, a stone-oven bakery. We ate delicious cardamom, sugar, and cinnamon buns, carrot cake, caramel biscuits, and a ridiculously tasty chocolate mud cake (kladdkaka) with berries, on our way to the Blue Lagoon. Hot tip: the café morphs into a pizzeria in the evening, serving delicious, naturally fermented grape juices. I snuck a photo of the wine selection on display. If you have time, swing by the Blue Lagoon (Blå lagunen) for a quick dive into the deep blue and green pond. 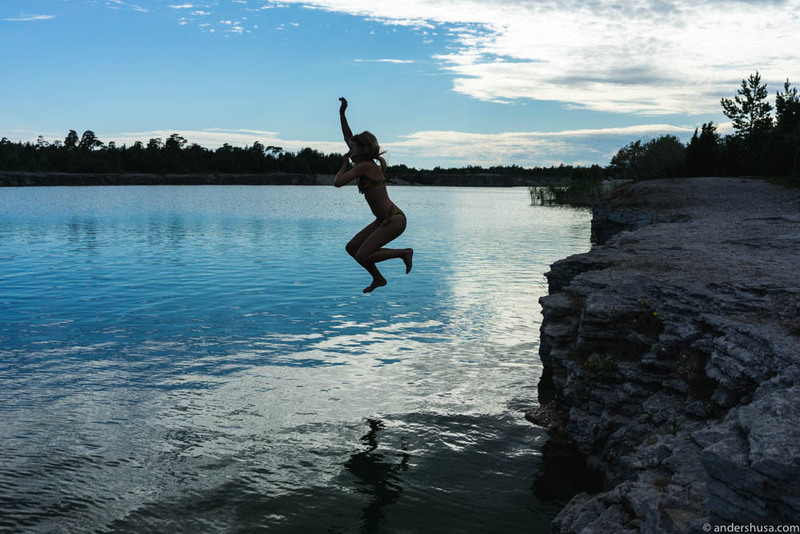 A freshwater lake in an old limestone quarry, with the sunlight being reflected by the bright yellow sand, is what produces the turquoise and azure blue color. … and back in again for another photo! Another farm store and lunch café on Gotland’s countryside, this time by a Stockholm couple (Martin and Emma) who decided to leave their stressful lives in the city. Prima Gård didn’t appeal as much to me with their raw cakes, as they did with their selection of natural wines. 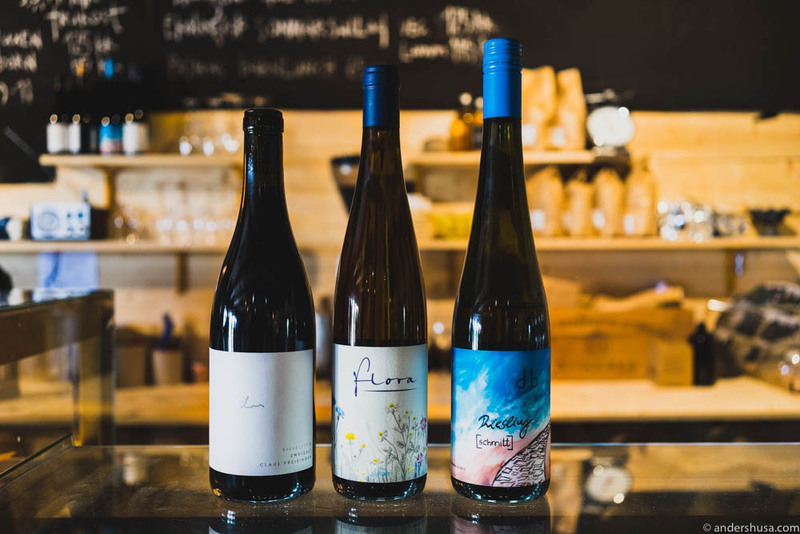 Some of my favorite producers were lined up on the counter, including Claus Preisinger and Michael Gindl. Another place we didn’t get to try this time, but heard great things about, is Furillen by Prima. 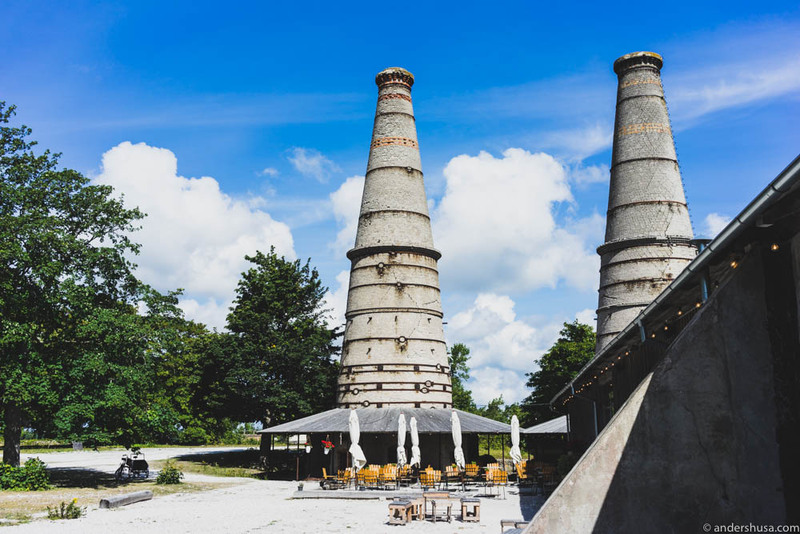 A restaurant project in an old limestone factory on the island of Furilden. Here, Prima Gård, similar to Lilla Bjers, serve exclusively their own produce, and the food is even plated on Emma’s homemade ceramics. Back to Bungenäs in the evening for a dinner at Calles Vinbar in Förvaltarvillan. You would have guessed this to be the home of Calle and Anna, considering the dining room features a long communal table, and the living room is complete with a record player, sofas, and a small wine bar on the opposite side. However, they actually live in one of the aforementioned bunkers, so this is, in fact, just a casual eatery they have built. 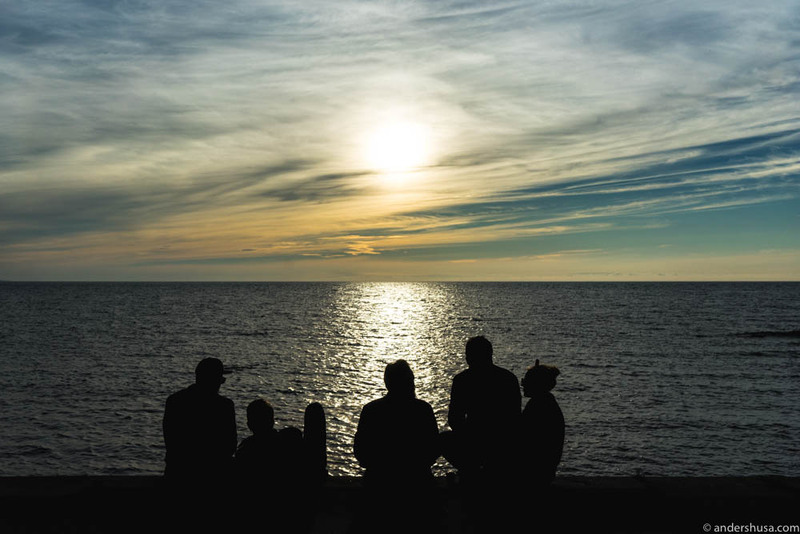 We sat outside on the terrace this warm summer night and ate the most memorable meal on Gotland. Full story soon! Have you been to Gotland? Did I miss any remarkable places for great food? Please leave a comment below. This travel guide is sponsored by Visit Sweden. They had no influence on the choice of recommendations or content of this article. I received no monetary payment. The guide contains affiliate links to booking.com for some of the hotels. Gotland <3 Så fine bilder, for et idyllisk sted! Following Gula Hönan, I think Krakas Krog in Kräklingbo is by far the most interesting food experience on the island. So sad you missed it – you’ll have to come back & eat and stay there another time (& do try some of the pop-up creperies on the island- there a wonderful addition to the culinary scene). I know, we really tried, but unfortunately weren’t able to get a taste of Krakas. Next time! Great guide. I would like to recomend the restaurant Krakas. Fantastic food, wines and service. A little off the main roads though. Thanks! Krakas was on the wish-list, but, unfortunately, they couldn’t seat us at the time. Oh wow, that was really interesting story, Thank you! Do you know, are there still those skulls, barbed-wire fences and iron gates…!? It looks like a really scary place. We are going to Gotland for a week in August. I’m trying to plan interesting places to visit and this is definitely one of them. This place rocks!